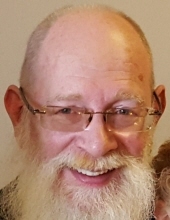 Mark D. Nail, 60 of Toledo, Ohio, formerly of Elyria, Ohio died Monday, September 10, 2018 in the Cleveland Clinic Hospital, Cleveland, Ohio following a brief illness. He was born to the late, Hazel Temple (nee: McNeal) and Earl James Nail on October 28, 1957 in Elyria, Ohio. Mr. Nail moved from Elyria to Toledo twenty one years ago. He served our country in the U. S. Navy. Mr. Nail was employed as an assembler for the Ford Motor Company at the Lorain Assembly Plant and the Flat Rock Michigan Plant for the past twenty five years. His life was centered around his family and work. He especially loved playing with his grandkids. Mr. Nail is survived by his wife, Dorothy I. (nee: Phelps) Nail, his son, Jacob D. Nail of Toledo, his daughters, Christina M. (Lois A. Pritchett) Nail of Toledo and Nina N. (Jeff A. Krause) Nail of Maumee, Ohio, brothers, David, Joe, Kevin, Rusty and Jason, sisters, Linda, Donna, Vickie, Tammie and Charity and three grandchildren. In addition to his parents, he was preceded in death by his brothers, Paul and Donald. The family will receive friends on Saturday, September 15, 2018 from 10 AM until 11 AM in the Walter A. Frey Funeral Home, 700 West Erie Avenue, Lorain, Ohio 44052. Funeral services will follow in the funeral home at 11 AM. Burial will follow in Resthaven Memory Gardens, Avon, Ohio with full military honors. To send flowers or a remembrance gift to the family of Mark D. Nail, please visit our Tribute Store. "Email Address" would like to share the life celebration of Mark D. Nail. Click on the "link" to go to share a favorite memory or leave a condolence message for the family.